Episode #384 Part IV: Superman Family Comic Book Cover Dated July 1965: Superman's Pal Jimmy Olsen #86! Superman's Pal Jimmy Olsen 86, July 1965! Download Episode 384 Part IV! SUPERMAN'S PAL JIMMY OLSEN 86, July 1965, was published on May 27, 1965. It contained 32 pages for the cover price of 12¢. Mort Weisinger was the editor, and the cover was pencilled by Curt Swan and inked by George Klein. It featured the issue's third and final story. - (1:37) MY PULL LIST segment, this time featuring the comic books cover dated November 2018, which were published during the month of September, that I received from Discount Comic Book Service. - (13:25) JIMMY OLSEN, APE MAN (9 pgs. ), written by Leo Dorfman, drawn by George Papp and lettered by Vivian Berg. - (29:45) JIMMY'S D-DAY ADVENTURE (9 pgs. ), written by Leo Dorfman, pencilled by Curt Swan, inked by George Klein and lettered by Milt Snappin. This story was also reprinted in SUPERMAN FAMILY 168, December 1973/January 1974. It contained 100 pages for the cover price of 60¢. The story also was reprinted in SUPERMAN: PAST AND FUTURE. 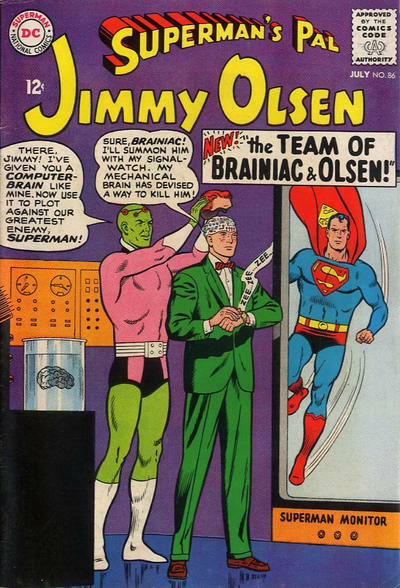 - (48:25) THE TEAM OF OLSEN AND BRAINIAC (6 pgs. ), written by Jerry Siegel, pencilled by Curt Swan, inked by George Klein and lettered by Milt Snappin. This was Siegel's 91st silver age Superman Family story that has been covered in this podcast, and his 145th overall for the era. - (58:46) JIMMY OLSEN'S PEN PALS letter column. - (1:04:41) ELSEWHERE IN DC COMICS 30 issues carried the July or July/August 1965 cover date, according to Mike's Amazing World Of Comics. Beginning Next Episode: SUPERMAN FAMILY COMIC BOOKS COVER DATED AUGUST 1965: PART I: 80 PG. GIANT 13 (starring Jimmy Olsen), PART II: WORLD'S FINEST COMICS 151, PART III: SUPERMAN 179, PART IV: ACTION COMICS 327 & PART V: SUPERMAN'S GIRL FRIEND LOIS LANE 59! Episode #384 Part III: Superman Comic Book Cover Dated July 1965: Action Comics #326! Action Comics 326, July 1965! Download Episode 384 Part III! ACTION COMICS 326, July 1965, was published on May 27, 1965. It contained 32 pages for the cover price of 12¢. Mort Weisinger was the editor, and the cover was pencilled by Curt Swan, inked by George Klein and lettered by Joe Letterese. 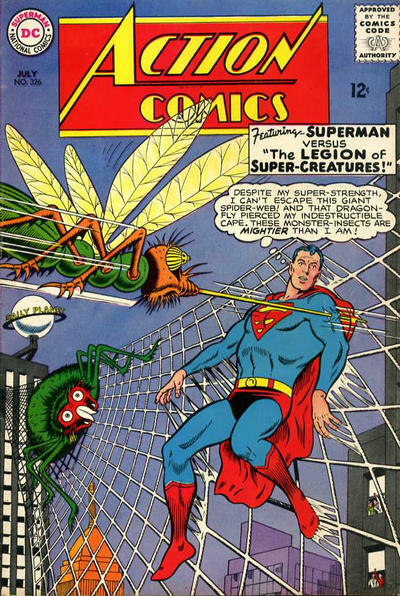 - (7:20) THE LEGION OF SUPER-CREATURES (12 pgs. ), written by Otto Binder, pencilled by Curt Swan, inked by George Klein and lettered by Joe Letterese. - (30:30) THE SECRET OF SUPERGIRL'S SUITOR (12 pgs. ), written by Jerry Siegel and drawn by Jim Mooney. This was Siegel's 90th silver age Superman Family story, and his 144th overall for the era. - (50:52) METROPOLIS MAILBAG letter column. Next Episode: SUPERMAN FAMILY COMIC BOOK COVER DATED JULY 1965 PART IV: SUPERMAN'S PAL JIMMY OLSEN 86 & Elsewhere In DC Comics, according to Mike's Amazing World Of Comics. Then we will cover: SUPERMAN FAMILY COMIC BOOKS COVER DATED AUGUST 1965: PART I: 80 PG. GIANT 13 (featuring Jimmy Olsen), PART II: WORLD'S FINEST COMICS 151, PART III: SUPERMAN 179, PART IV: ACTION COMICS 327 & PART V: SUPERMAN'S GIRL FRIEND LOIS LANE 59! 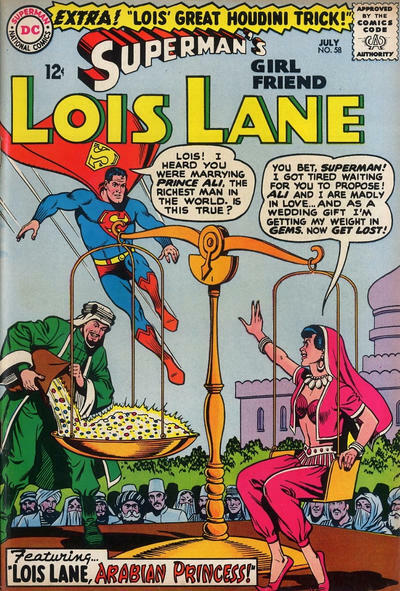 Episode #384 Part II: Superman Family Comic Book Cover Dated July 1965: Superman's Girl Friend Lois Lane #58! Superman's Girl Friend Lois Lane 58, July 1965! Download Episode 384 Part II! SUPERMAN'S GIRL FRIEND LOIS LANE 58, July 1965, was published on May 13, 1965. It contained 32 pages for the cover price of 12¢. Mort Weisinger was the editor, and the cover was drawn by Kurt Schaffenberger. He also was the artist for all three stories in this issue, which were all written by Otto Binder. - (7:52) LOIS LANE'S GREAT HOUDINI TRICK (6 pgs. ), lettered by Vivian Berg. - (22:38) LOIS LANE, SPY-HUNTER (9 pgs. ), lettered by Vivian Berg. - (40:00) THE CAPTIVE PRINCESS (9 pgs. ), lettered by Milt Snappin. - (56:15) LETTERS TO LOIS. Next Episodes: SUPERMAN COMIC BOOKS COVER DATED JULY 1965: PART III: SUPERMAN 179 & PART IV: ACTION COMICS 327! Then we will feature: SUPERMAN FAMILY COMIC BOOKS COVER DATED AUGUST 1965: PART I: 80 PAGE GIANT 13 (starring Jimmy Olsen), PART II: WORLD'S FINEST COMICS 151, PART III: SUPERMAN 179, PART IV: ACTION COMICS 327 & PART V: SUPERMAN'S GIRL FRIEND LOIS LANE 59!